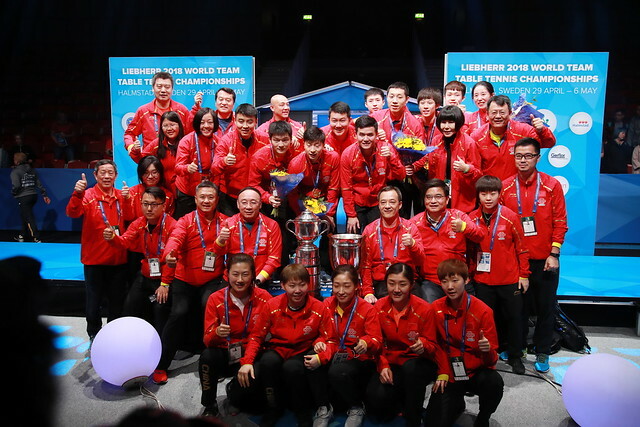 The Chinese Men’s Team are the 2018 Men’s Team World Champions after a comprehensive victory over Germany in the Liebherr 2018 World Team Table Tennis Championships which concluded today, 6 May 2018 in Halmstad, Sweden. This was the 21st time that the Chinese men’s team lifted the Swaythling Cup, and it matches the Chinese women’s team’s achievement from yesterday. The defending Champion faced long-time rivals, European Champion Germany in the final battle for Gold. A bombshell was dropped by Germany one hour before the match started, with the number one seeds leaving the world #3 Dimitrij OVTCHAROV out of the team due his poor condition due to injury. In the opening match, reigning World Champion MA Long was in domineering form, sweeping table tennis legend Timo BOLL 3-0 (11-4, 11-8, 11-3) to give the Chinese team a 1-0 lead. Newly crowned world number one FAN Zhendong fresh from his first Asian Cup victory just last month in Yokohama, Japan, continued his top form against Ruwen FILUS to win 11-4, 11-5, 11-4 to help China establish a comfortable 2-0 lead. XU Xin finished the job for China against Patrick FRANZISKA 3-1 (9-11, 12-10, 11-7, 11-5) to put a stamp on the Chinese dominance and close out the championships. World #1 FAN Zhendong was crowned the most valuable player, after going through the tournament undefeated and showing why he is the best player on earth! With the crowning of Men’s Team Champion today, the 8-days Liebherr 2018 World Team Table Tennis Championships has come a close at the Halmstad Arena in Sweden. Earlier yesterday, the Chinese Team also claimed their 21sttitle in the Women’s Team event after a convincing 3-1 victory over Japan. In the second division of the 2018 World Team Championships, Iran and Hungary Men’s Team defeated Ukraine and Slovakia respectively to advance to the Championships Division. The Spanish and Turkish Women’s Team too knocked out France and Italy respectively to be part of the top 24 teams to be fighting to be World Champions in the 2020 edition of the World Team Table Tennis Championships in Busan (KOR). In the third division, it was Lithuania Men’s & the Indonesian Women’s Team who prevailed to progress to the second division. The world’s best players now turn their attention back to the Seamaster 2018 ITTF World Tour, with the next event, Hang Seng Hong Kong Open happening from 24 – 27 May 2018.